Marc Fellhauer (@MarcFell) is here and Hank Winchester (@HankWinchester / @HelpMeHank) stops by today. Matt Boyd of the Tigers was sooooooooo close to a no no in a meaningless game. Meanwhile, JV is still doing great things for a playoff team. St. Louis protests riots were the big story over the weekend. More protests over the bizarre death of a girl in Chicago, but the video speaks volumes. Love the fact that the Juggalo March in D.C. had more people than the Anti-Trump protest and the pro-Trump “Mother of All Rallies”. Speaking of ICP, Brian McCollum had an interesting article on the similarities & differences on Kid Rock , Eminem & ICP over the past 20 years. Let it Rip had Sam Riddle on last Thursday. I hope there was lots of yelling! The Free Press continues its mea culpa by letting one of Olympia’s own write a rebuttal opinion about the Ilitch family. Stanford University invented a working gaydar. Billie Jean King admitted to a lesbian affair in 1981 to avoid being extorted. Will that be in the movie? Today in Rock: Ford added a sweet featuring in their cars, silly death hoax & a rock WAG overdosed. Norm Macdonald had Rich Little on his talk show. Marc swears that Rich Little told good stories… even if all the impersonations were of people that are now dead. Drew swears that the super long Free Press story on food trucks in Detroit is an interesting story. We need to discuss today’s Mitch Albom article before our special guest arrives. Our special guest arrives during our discussion of today’s Mitch Albom article. It’s Hank Winchester from Help Me Hank on WDIV! 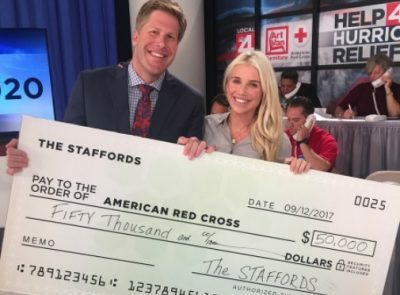 Hank just did the big Hurricane relief fundraiser on Local 4. He’s working on helping viewers work through the Equifax disaster this week. Remember the time Hank dressed down the home inspector? Hank remembers it for some awkward microphone placement. “Hot Cop” isn’t so hot anymore. Some never thought he was that hot anyway. This kid is 11 and knows everything so he decides not to stand for the Pledge of Allegiance. His teacher in turn assaults him. A better 11 year old mowed the White House lawn, but he should have waited until the grass was dry. The First Lady and the President shared a handshake. President Trump insists his hands are large while passing out hoagies. Hillary still isn’t looking in the mirror. Maybe she should if she believes she did a good job campaigning in Michigan. Hank’s gaydar is put to work. He’s the final authority on the Gen Z “expert”. Lem Barney is not dead, but he did wear #20. Drew has lost interest in the NFL. We all have opinions on Hank’s friend Matthew. Cats v Dogs: collision course. Detroit loves the local news. How do we really know what Tommy Lee Jones is saying? He could just be saying “pizza” & “monsters” like this guy.